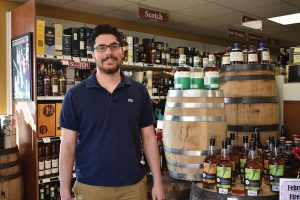 Lake Wine & Spirits Co-owner Sam Kratzer. 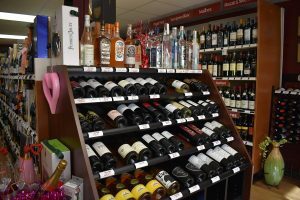 Known as the oldest package store in town, Southbury’s Lake Wine & Spirits has operated in several locations over its 72 years in business – with the latest in a building on Main Street South between hardware stores H.H. Stone & Sons Inc. and Chatfield Tru Value Hardware. Father and son team Sam Kratzer and Gary Kratzer purchased the store in March of 2016, and while they had no previous experience in the industry, Gary had a background in corporate reinsurance and Sam had studied economics and business in college, skills which translated well into ownership. 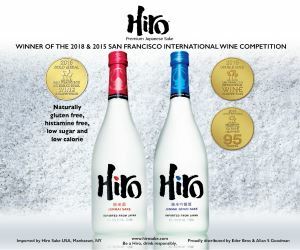 Over the past three years, the duo has created a beer, wine and spirits destination that appeals to a wide range of customers, from those purchasing single beers and nips to the luxury spirits buyer, according to Sam Kratzer. And perhaps while cocktail trends may not appeal to the demographic tastes of local shoppers, an ever-rotating and carefully managed inventory does reflect national trends. Kratzer said he’s noticed an uptick in the sales of all spirits, especially whiskey. 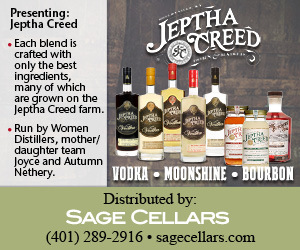 Private label selections from barrel purchases with local distilleries are also popular. 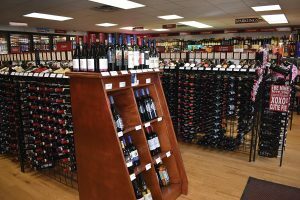 The store also carries over 2,500 wines, featuring many “Top 100” from renowned ratings resources, along with organic and biodynamic picks and local wines from Jones Winery, Hopkins Vineyard and Sharpe Hill Vineyard, among others. “We’re not stagnant with our products,” Kratzer said. 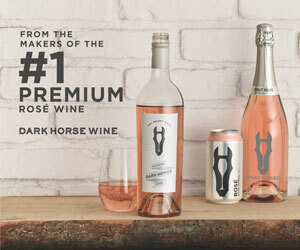 “We try to use social media to highlight promotions or events or new tastings that we’re doing.” Tastings are held every Friday evening in the store’s designated station at the front of the store. 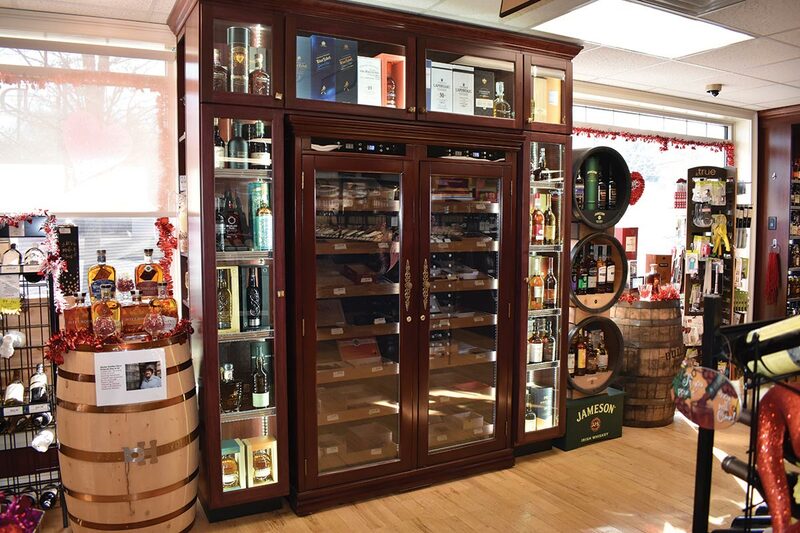 Adjacent to that is the shop’s specially designed, temperature- and humidity-controlled cigar humidor. 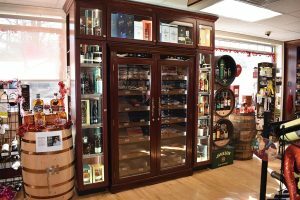 Built-in shelving around the humidor houses high-end selections of whiskey to appeal to those customers who are looking for that special pairing with their cigar selections. 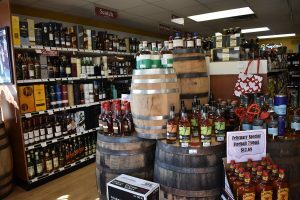 Lake Wine & Spirits customers will soon have even more selections to choose from with a redesign and expansion of the shop planned within the next year. Set to almost double the building’s square footage, the redesign will allow for more room to display new products, double the number of cooler doors for beer and increase space for wine and spirits as well. 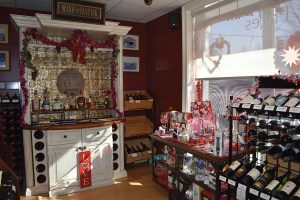 Maintaining a store environment that’s welcoming for the customer is a distinction, said Kratzer, from the details of decorations and presentation, such as Valentine’s Day during a February visit, to the most important, friendly and knowledgeable interactions with customers. Inside Lake Wine & Spirits.